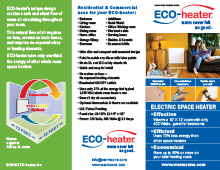 How Much Space Do ECO-heaters Require? 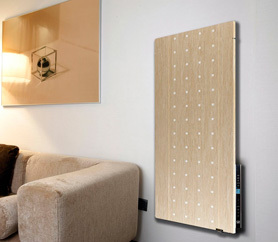 ECO-Heaters are compact thin electric panel heaters that mount on the wall and safely emit heat. 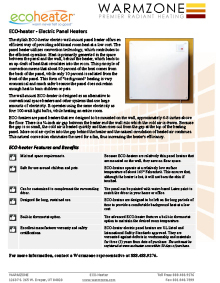 One benefit of ECO-heaters is that they are mounted on the wall, saving valuable floor real estate. The heater dimensions are 23¼ x 23¼ x ⅜-inches and weighs approximately 15 pounds. Each heater package contains one 400 watt electric panel heater, mounting kit, installation instructions and Styrofoam packaging that also serves as a convenient mounting template. ECO-heaters are designed to be mounted approximately 6-8 inches above the floor, giving the heat a chance (and plenty of space) to rise and sufficiently heat a smaller space. 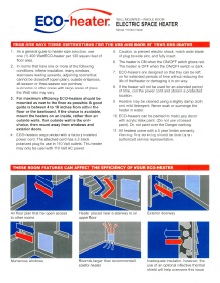 Ideal for bathrooms, kitchens, even offices, the ECO-heater is an efficient method of heating a room. There is a ¾-inch gap between the heater and the wall allowing cold air to be drawn behind the heating panel. The gap is small enough to allow the cold air to heat quickly and rise from the gap at the top of the heating panel of the ECO-heater. Cool air cycles into the gap behind the heater as well and natural circulation of heated air cycles continually. This natural convection takes away the need for a fan, which increases the heater’s efficiency and decreases the need for more space devoted to this compact wall mounted heater. You can find them for less than $130, making them an affordable and compact way to heat any chilly space. Most things that hang on your walls at home or office are just for eye catching appeal, but what if you get another benefit from wall art? What if you learned about Climastar wall-mounted heaters and suddenly discovered that comfort and warmth could also look attractive too? That would be pretty great, huh? Well, it’s true. Wall heaters can not only add much needed warmth to a chilly room, they can look good doing it. 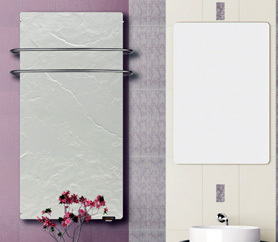 The Climastar wall-mounted heater has been designed for functionality as well as beauty. The innovative design allows energy efficient heat to permeate your bathroom at work or home or any other room you need a heating boost. 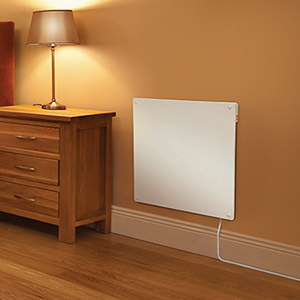 Wall-mounted heaters consume very little power but allow enough heat to be generated to heat an entire small room. Climastar offers many attractive choices to suit your unique taste and design ideas. Having a wall-mounted heater doesn’t mean you have to hang a looming hideous dinosaur on your wall. These wall heaters have eye-catching stone facades to give the sophisticated look and feel of wall art while adding the durability, functionality, and heating power of a wall-mounted heater. Each heater allows you to program a specific temperature giving you flexibility to set the heat to your comfort level with ease.